You can print entire or partial worksheets and workbooks, one at a time, or several at once. And if the data that you want to print is in a Microsoft Excel table, you can print just the Excel table. Before you print anything in Excel, do remember that there are many options available for an optimal print experience. For more information, see Printing in Excel. Important: Some formatting, such as colored text or cell shading, may look good on the screen but not look how you expect when it prints on a black-and-white printer. You may also want to print a worksheet with gridlines displayed so that the data, rows, and columns stand out better. 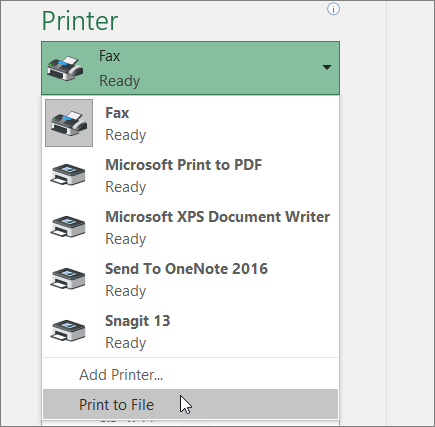 Select the worksheetsthat you want to print. Click File > Print, or press CTRL+P. Click the Print button or adjust Settings before you click the Print button. Hold down CTRL click the name of each workbook to print, and then click Print. Click the worksheet, and then select the range of data that you want to print. 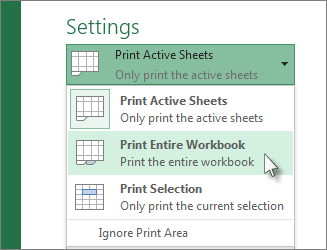 Under Settings, click the arrow next to Print Active Sheets and select the appropriate option. 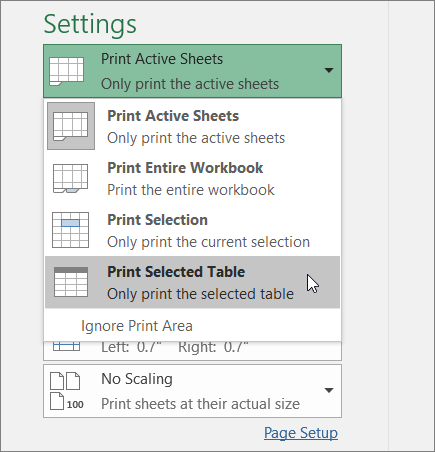 Note: If a worksheet has defined print areas, Excel will print only those print areas. If you don't want to print only the defined print area, select the Ignore print area check box. Learn more on setting or clearing a print area. Under Printer, select Print to File. Important: If you print the saved file on a different printer, the page breaks and font spacing may change.